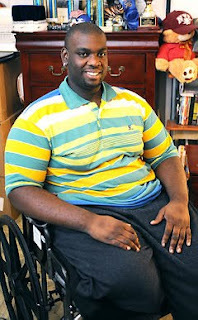 Anybody at the New York City Housing Authority who paid proper attention to his family's application would have seen that 18-year-old Christopher Williams (pictured) is disabled and in a wheelchair, having lost his right leg as a manifestly innocent victim of gun violence. Yet, the housing folks went ahead and placed the former Fort Hamilton High School football star and homecoming king in a 12th-floor apartment in a Brooklyn building slated for elevator renovation that would make his new home inaccessible for more than three months. Williams was only informed of the impending shutdown when a notice went up in the 13-story building in the Walt Whitman Houses. The notice was posted between the two elevators, only one of which rises above the seventh floor. Construction of each elevator will take approximately 14 weeks. Williams had shown uncommon courage and grace after being shot nine times with a .45-caliber automatic three years ago. He kept his spirits up even when he was told the amputation was too high up his leg for him to wear a prosthesis. He now found himself ambushed by a piece of official paper that gave him three days to find a place to live for more than three months. "If I can't get upstairs with the elevator, what am I going to do?" he asked. The Housing Authority offered no immediate assistance. Williams sought out everyone he knew who lived in a wheelchair-accessible place and might shelter him for the duration of the construction. "I was asking friends, 'Can I stay with you guys? I'll pay you guys rent,' but they all said no," Williams recalled. Williams had yet to find an alternative when workers painted "ELEVATOR OUT OF SERVICE" in red on the door to the lone conveyance to his apartment. "I felt like I was homeless," he said. His only immediate option was the nearby New York Marriott Hotel at the Brooklyn Bridge, which charged him $400. "For one night," he said. "No room service, nothing." He faced sleeping in the street when the Housing Authority finally came through with a fourth-floor apartment in another building. That proved four floors too high on a day that elevator broke down and, to his great distress, he missed class at the College of Staten Island. In the meanwhile, workmen at his previous home seemed in no hurry to finish despite the tenants still on the upper floors, including one elderly man who uses a walker. Yesterday, nobody was working at all. The 72 Hours Notice was still on the wall, along with two work permits. One was issued on June 8, the other on May 5, the same month that the housing folks put a magnificent young man who lost a leg to violence on the 12th floor. NYCHA said they're looking into the matter. Often, the problem is not big government, but small.